Portable saunas offer the perfect solution for people who are on the go but still want to enjoy the benefits of a relaxing sauna. They are available in a wide variety of designs – from larger, hitch-and-go designs to compact, fold-up tent saunas. These convenient amenities provide all the warmth and comfort of a traditional sauna but in a smaller, compact design. People with medical conditions that benefit from sauna therapy no longer have to stop their sauna treatment thanks to these mobile units. Over the years, sauna technology has advanced tremendously and is no longer limited to stationary saunas. Portable saunas became an instant hit with customers everywhere, and since the launch of the first portable unit, sauna manufacturers have developed unique and fun designs for you to enjoy anywhere in the world. If you’re a sauna enthusiast that is constantly on the road, a portable sauna is the perfect solution to satisfying your hot box desires. To ensure that you’re properly educated on the benefits of mobile sauna units, let’s take a look at some of the more popular portable sauna designs available on the market. Take your Mobile Sauna wherever you go! These units make the quintessential addition to any road or camping trip. 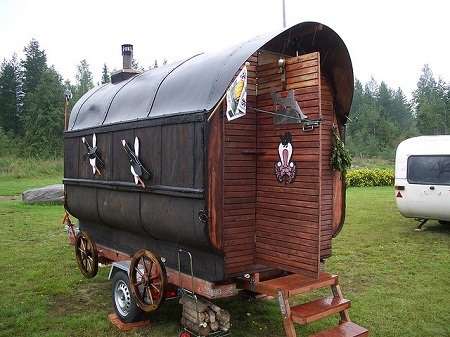 Once you’re done packing the truck for your weekend getaway, simple hitch the unit, hit the road, and arrive at your favorite campsite with your very own sauna. Mobile saunas are typically the largest model of portable units and are generally able to accommodate up to 8 people effortlessly. Furthermore, mobile saunas encompass both infrared and electric heating elements. If you’re searching for a simple, compact design that can be transported virtually anywhere in the world with ease, the portable sauna is the choice for you. These fun units come in several designs and allow you to experience total relaxation and comfort almost anywhere. 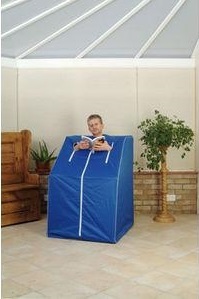 With an average weight of around 30 pounds, portable saunas make the perfect accessory for anyone. Portable saunas are available in your choice of electric or infrared heating elements, and offer the same levels of comfortability and relaxation as their stationary relatives. Infrared saunas offer tremendous health benefits and relaxation that is second to none. They utilize infrared burners that emit infrared light, and heat the surrounding area with radiant heat. Portable infrared saunas are the perfect choice for health conscious individuals that want to reap the rewards of sauna treatment wherever they desire. Steam saunas utilizes high pressure moisture to create extremely humid conditions. Steam therapy has been practiced by several cultures around the world, and is proven to increase blood circulation and promote healthy skin. These units provide a wonderful sensation through hot, humid air, and cannot be duplicated by their dry heat cousins. If you’re interested in pursuing steam therapy to increase your health, a portable steam sauna may be the ultimate option for you.